Joshua Clottey has ended the world title aspirations of Anthony Mundine, knocking the three-time world champion down five times on route to a unanimous decision win. Clottey proved too strong for Mundine, with the Ghanaian regularly getting through the defence of the Australian. The Ghanaian found himself on the deck early in the 2nd round, but the referee correctly ruled that is what a result of a rabbit punch, issuing Mundine a warning. Mundine felt the power of Clottey soon after, hitting the canvas for the first time in the Round 3. Mundine was caught standing right in front of Clottey and a powerful right hand sent him down. The Australian was able to beat the count, before the bell sounded signalling an end to the round. Before the knockdown, Mundine was the busier of the two fighters, using his jab well, however upon the start of the third round Mundine would become more tentative, which allowed Clottey to walk forward and assume control of the contest. From there Clottey seized control, throwing and landing some big shots, with Mundine spitting out his mouthguard in Round 4 to avoid what was looking like another knockdown. Clottey began putting more emphasis on bodywork and as Mundine tired, his guard became less effective. Clottey seized the opportunity in the 6th round, dropping Mundine twice. The first was setup with a nice hook that saw Mundine take refuge against the ropes before Clottey sent him crashing down with a rip to the body. Mundine again beat the count, but it was only a matter of time before he would fall again. Mundine just beat the count on the second knockdown, and just as he did earlier in the fight, he was saved by the bell, ending the round before the action could resume. 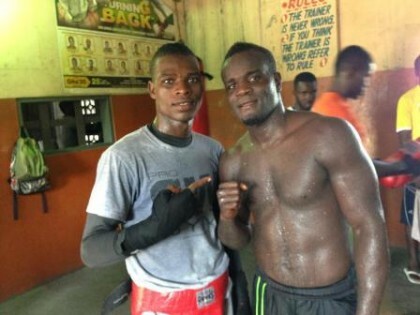 From here it was all Clottey as the Ghanaian increased his work rate looking for a finish. It almost came in the 8th round as Mundine was caught against the ropes and a crushing hook from Clottey almost sent him through them and out onto the commentators at ringside. Once again though, miraculously, Mundine was able to beat the count. Mundine was knocked down for a fifth time in the 10th round, just as it looked like he was beginning to rally. Somehow the Australian was able to go the distance, with Clottey taking little risk and Mundine not really willing to engage or enter the ‘kill zone’ in case another knockdown. All three judges ruled in favour of Clottey, with the official scorecard reading 116-108, 115-109 and 117-108. It was a tough night for the Australia and Mundine showed none of the hand and foot speed and his trademark jab, although effective early, was almost nonexistent after the first knockdown. Clottey set the tone early, with Mundine tasting his power and the Ghanaian showed little respect for the Australian’s shots, regularly coming forward looking for the big blow that would finish the contest. Clottey questioned the decision of Mundine to campaign at Junior Middleweight after the fight, saying he felt the three-time World Champion was better suited to the 154 pound Middleweight class. Mundine made no excuses, saying the early knockdown meant he had to go away from his game plan. Mundine said the loss would not end his career, highlighting potential fights with fellow Australian’s Danny Green and Daniel Geale. With Geale reportedly signed to fight Matthew Macklin in May in a World Title eliminator, it leaves only Green as a potential target, and with both enjoying such a storied rivalry, a second fight between the pair has always been a fallback option. The problem of finding a suitable weight division to contest the fight has been raised as an issue, but I feel a catch weight or contracted weight near the light-heavyweight limit is the most likely option.